As the Senate begins discussions over the American Health Care Act (AHCA), a key point in the negotiations is federal funding for the Medicaid program. The AHCA proposes subjecting Medicaid spending to per capita caps, limiting the number of dollars the federal government will provide to states for each enrollee. While per capita caps themselves are a major departure from how Medicaid has traditionally been funded, the exact effect of caps depends on unpredictable trends in state Medicaid spending and how the caps are indexed to grow over time. Under current law, Medicaid pays states for a set percentage of the cost of health care for people on Medicaid, granting state programs the flexibility to offer Medicaid coverage as the eligible population shrinks or grows or as costs rise. 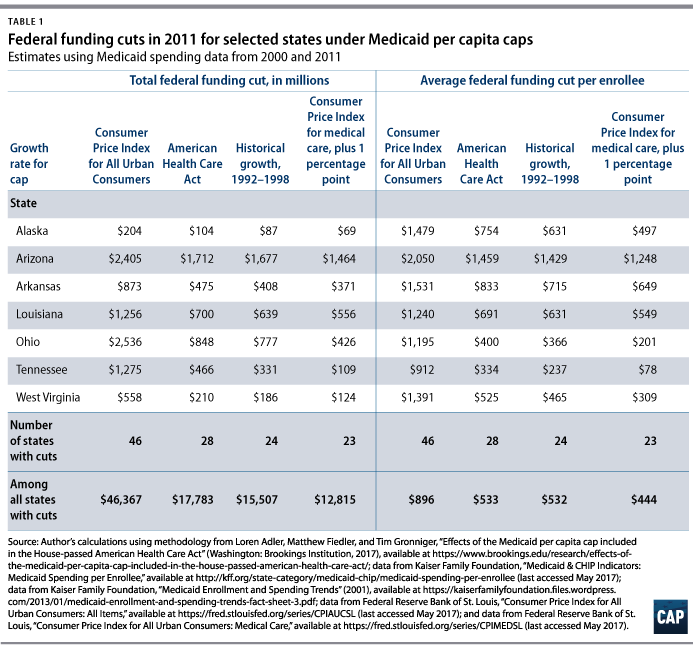 Per capita caps would set limits on Medicaid expenditures for each state, and the federal government would decide how quickly the caps rise over time. In any state where the caps grow more slowly than actual costs, states will be faced with tough decisions, including raising additional funds, cutting other state services to pay for Medicaid, slashing payments to medical providers, trimming benefits or eligibility, or forcing a greater share of health care costs onto beneficiaries. In the version of the AHCA that passed the House in early May, per capita caps for nondisabled children and nonelderly adults would grow at the rate of medical care inflation, while the caps for the elderly and disabled grow at the faster rate of medical care inflation plus 1 percentage point. 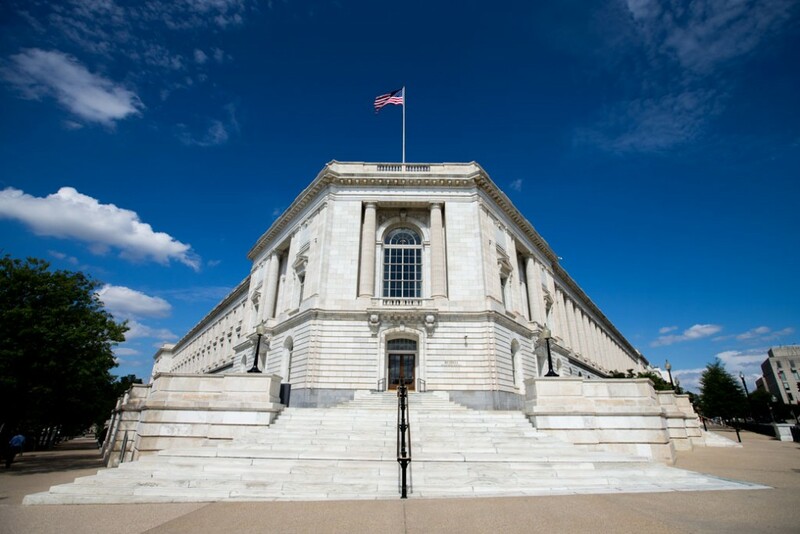 Senators, however, are considering revising these rates so that either the caps would grow more slowly, thereby reducing potential Medicaid funding cuts, or faster in order to achieve greater federal savings. The caps could spur cuts in in enrollment and benefits that would be devastating for the Medicaid population, including the elderly, children, and the disabled. Caps place downside risk on state budgets wherever future social, demographic, or environmental factors drive actual Medicaid costs greater than the overall trend in medical out-of-pocket costs. For example, rising opioid addiction, Zika infections, costly new pharmaceuticals, and changing demographics could all put a strain on Medicaid resources in the near future, but different states will experience these factors to different degrees. For example, a surge in the number of relatively healthy individuals enrolled in the program will bring down the cost of an average adult, while the aging of the elderly or disabled populations could push costs within those categories upward. To determine how states would be affected by per capita caps, we examined historical Medicaid data and calculated the federal funding reductions states would have faced if per capita caps had been in place. We follow methodology developed by researchers at the Brookings Institution to compare historical Medicaid spending against what capped amounts would have been. We use data on 2000 and 2011 per-enrollee spending from the Kaiser Family Foundation for four categories of Medicaid enrollees: the aged, individuals with disabilities, children, and adults. * Our analysis assumes that no state would have reduced enrollment or made other changes to its program. In reality, different states would adopt different tactics to adapt to the restriction of federal funding. First, we discuss the cuts that would occur if caps resembled those in the House-passed AHCA. The next scenario examines the impact of more generous caps, set to rise at a rate faster than medical inflation in all years. Our third scenario looks at the impact of stricter caps that would grow with overall inflation instead of with faster-rising medical inflation. Lastly, we show what federal funding cuts would have been if growth in the caps were set at the rate of historical Medicaid per-enrollee spending in years prior to the caps’ implementation. Under the AHCA’s formula, 28 states had per-enrollee Medicaid spending in 2011 that would have exceeded the cap. Absent any changes to those states’ Medicaid programs, the total federal funding reduction would have been $17.8 billion in 2011. The size of the cut would have varied widely among states. Table 1 provides examples of the magnitude of the cuts for a handful of states. For example, if the AHCA’s per capita cap had been put in place in 2000, Ohio would have received $848 million less in federal funding in 2011. This would have been a sizable reduction, equivalent to the average federal support Ohio received to cover 120,000 enrollees. Nearly all states would have faced reductions in federal funding if the cap were set to grow with overall inflation. The consumer price index for all urban consumers (CPI-U) measures inflation for a wide set of goods and services, and it tends to rise more slowly than that for medical care. Per capita caps pegged to CPI-U would have led to a reduction of federal funding in 45 states as well as the District of Columbia in 2011. In total, federal Medicaid funding to those states would have been reduced by $46.4 billion that year. Many states would still have seen cuts if the caps had grown faster than under the AHCA’s formula. If the caps were indexed to medical inflation, known as CPI-M, plus 1 percentage point in all years, we find that federal Medicaid funding would have been reduced by $12.8 billion in the 23 states that would have exceeded their caps in 2011. Our exercise also demonstrates that historical Medicaid spending trends are not predictive of individual states’ future needs: If the cap for each enrollee group was set to grow at the same rate it did over the period of 1992 to 1998,** then 23 states would have suffered federal cuts totaling $15.5 billion in 2011. Even when caps are indexed to a rate that appears generous relative to recent growth, they could quickly become restrictive. Under every cap we examined, federal funding would have been cut significantly for Alaska, Arizona, Arkansas, Louisiana, Ohio, Tennessee, and West Virginia, among other states. Even under the most generous cap, the average cut per enrollee in 2011 would have been $497 in Alaska, $1,248 in Arizona, $649 in Arkansas, $549 in Louisiana, $201 in Ohio, $78 in Tennessee, and $309 in West Virginia. While the historical data we use are not predictive of future spending patterns for any particular state, our analysis does show that even if per capita caps were indexed to grow faster than trends in medical costs or than prior years’ spending growth, many states would face serious funding shortages for their Medicaid programs. Recent forward-looking analyses have also projected sizable funding cuts stemming from Medicaid per capita caps. The health care consultancy Avalere estimates that per capita caps indexed to overall inflation would result in $110 billion in federal funding cuts over a five-year period. In its simulation of the AHCA, the Urban Institute modeled per capita caps tied to CPI-M and estimated the AHCA’s changes would result in a $457 billion reduction in federal Medicaid spending over a 10-year period. The Congressional Budget Office projects that by instituting caps and halting expansion, the AHCA to will cut $834 billion in federal Medicaid funding over 10 years and reduce Medicaid coverage by 14 million in 2026. The per capita cap stacks the deck against states and against individuals with greater health needs. The AHCA’s caps would put a ceiling on federal funding for Medicaid, limiting the assistance available to states in the face of future health crises and population aging. If states become unable to make ends meet, beneficiaries would likely see contractions in enrollment, cutbacks on benefits, or restricted access to providers. *Because our data is from the period before the ACA, we do not estimate the reductions in funding for the AHCA’s fifth category of Medicaid beneficiaries included under per capita caps: adults newly eligible for Medicaid under the ACA. Data were unavailable for New Mexico, which we have omitted from our analysis. **Our scenario that sets caps to grow at the same rate as preperiod trends uses available data from the Kaiser Family Foundation for the years prior to our period of analysis. For each enrollee category, we inflated the caps according to the corresponding average growth rate between 1992 and 1998.